Few albums in the history of contemporary American music can be more deserving than this one of the designation OJC. 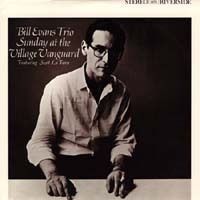 It is the first of two Riverside albums derived from the legendary final appearance of the first Bill Evans trio-taped during the last day of Village Vanguard engagment, barely ten days before the tragic death of bassist Scott LaFargo. The recordings have long been recognized as capturing the essence of the unique three-way interaction that characterized the trio. This album is further distinguished by its emphasis on the solo work and compositions of the innovative LaFaro. Customer Reviews (4.00 Stars) 1 person(s) rated this product. I loved this recording; it was superb!